Cody and I love fly fishing the rivers and streams of the Hill Country. Now that I am retired from work (but not from grad school), I have tried to attend many of the events work prevented me from attending. 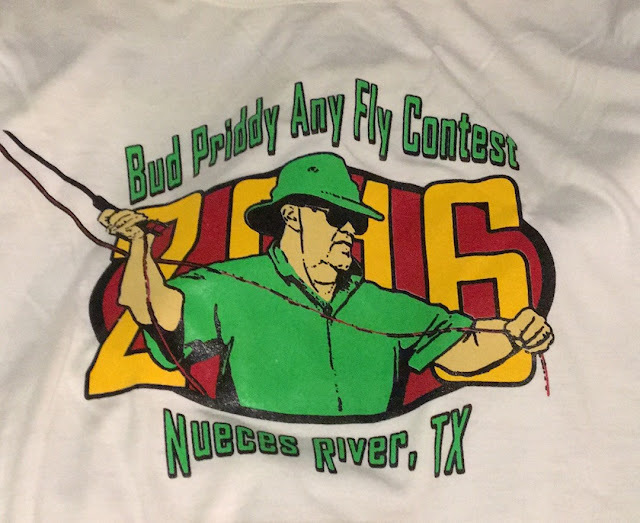 As Bud Priddy is a Texas Legend, I really wanted to attend this event co-hosted by the Alamo Fly Fishers, the Texas Women Fly Fishers, and Project Healing Waters. Cody had it on his calendar, so I worked on my class papers, lessons, and projects to be able to attend. We drove down state highway 55, which meant we drove right through the heart of the Nueces Canyon. I had never heard of nor been in the Nueces Canyon, and so this was a real treat, especially since everything was so green from the last two years' worth of rains. We were delighted at our first glimpses of the Nueces River, as it was flowing and crystal clear. We decided to bring our float tubes since the river is long and meandering and kayak access is not always readily available. We stayed at Big Oak RV park just inside Uvalde County, and what an accommodating and upscale place this campground is. While there is river access, it's a bit of a hike to the river. State Highway 55 follows this section of the Nueces, so we did some scouting of the upper sections on Friday night, after checking in with TWFF and AFF, and eating the best hot dog I ever ate in Barksdale. Even though fishing began at dawn Saturday morning, I had a little gut rot to overcome, so we did our usual, awake when awake. It took us awhile to set up and outfit our tubes, but once we got that settled, we headed north. Cody was casting to some Sunfish, when a peace officer pulled up. We thought we were going to be asked for our licenses, but no. Officer Max wanted to know about fly fishing, so Cody gave him a really nice lesson; I continued to rig up. We found the least treacherous way to the water, and I put in at the end of a nice set of class-II rapids--overhanging rocks, trees and grasses, and nice eddies meant there were some hungry, unsuspecting fish to be caught. However, the first order of business was to target the fish in the middle of the river, about 12 feet down. Cody stood up top and guided my cast to where the Sunfish were hanging around an unoccupied bass bed. Good direction, decent cast, and FishOn! At first I thought I had a Bass, but instead, it was a nice Redbreast Sunfish with late spawning colors. She measured 9 inches on the board! Start the fish count on the scorecard with the first catch of the day! I kicked back up stream, hard work, and fished the shorelines and caught three more decent size Sunfish--Greenies and Bluegills in the 7 inch range. Then, Cody and I floated our way down to the low water crossing. We pulled Bluegills, Largemouth, and Guadalupe Bass from the shoreline. 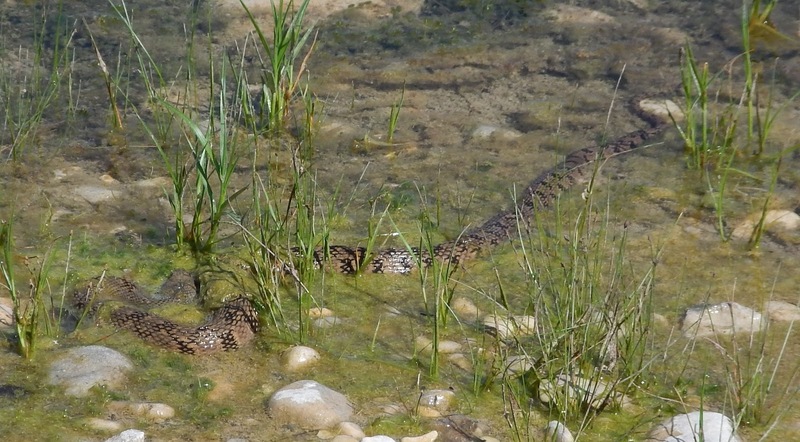 I politely waited for the snakes, mostly non-poisonous, to swim by before casting. After taking out, we decided to drive to other low-water crossings downstream, to see what the water quality and flow was like. We had only a little luck at one spot around Co. Road 416, so we moved farther down. Second jackpot of the day. Cody waded upstream, and I waded downstream. My day almost ended quite disastrously, as I was about a foot-and-a-half from stepping on a diamondback water snake, but thanks to my new, polarized sunglasses, I spotted that gullet-filled fellow, and gave it a wide berth. I fished the tail-end of a nice, wide riffle and caught two more Sunfish, and then headed to the other side, which was much deeper and quicker, and I pulled out three Guads. They sure shone golden in that crystal clear water. Earlier, some folks had been swimming in a deep water, swift current pool created by the culverts under the low-water crossing bridge right at the shoreline. I couldn't really see any fish, but just couldn't pass up the opportunity to give it a try. Cody had returned from his sojourn upstream and was watching from above on the bridge. I had fished the first three culverts, when I decided to give the swirling eddy of the middle culvert a try. My fly got down fast, and I thought I was stuck on debris. Cody hollered and whooped and threatened me about losing the fish. He came down and helped me land and measure my personal best on a Guadalupe Bass, 12 1/2 inches. That was it; we were finished for the day, as it was time to turn in our scorecards. After picking up some trash and speaking with a friendly Texas Game Warden for a bit, we headed back to camp. Realizing that my 14 fish for the day, seven Sunfish, seven Bass, were not any where near competition standards, especially since last year's Total Fish category was near 200 caught fish, I just turned it in for show. The event hosted silent auctions, an excellent BBQ dinner, raffles, and awards, and Cody and I made a good show in several categories. For the Tournament awards there were three categories: Largest Bass, Largest Sunfish; Most Fish Caught. 1st, 2nd, 3rd places and an Honorable Mention were awarded in each category. My 12 1/2 inch bass wasn't too far behind the leaders of 15 inches, 14 1/2 inches, 12 7/8 inches, and 12 3/4 inches, so I was pleased about that. I didn't come close to the most fish caught, but Lo and Behold, my 9 inch Bluegill put me in a four-way tie for first! Before the awards had been announced, we voted on how the tie-breaker was to be decided, which was by number of fish caught. I ended up with the third place prize of a trophy and a Simms Waypoints Chest Pack. However, the steal of the night was our silent auction winner. Lefty Ray Chapa had donated a first edition Bud Priddy Fly Fishing the Texas Hill Country book to the TWFF silent auction. I told Cody I really wanted that book. Cody agreed and let me price it to where there was no competition. We later learned during the recognition portion of the night, that Bud's wife, Pat Priddy and all four of the Priddy children were in attendance. Pat spoke briefly and thanked us for continuing this event in Bud's memory. After our group photo, I asked Pat if she would autograph our newly won, pristine condition copy, which she graciously did. Since there was enough daylight at the end of the night's events, Cody and I made the short drive over to the Camp Wood Cemetery and paid our respects to Bud. This was a great event, funded by grant money no less, and one we hope to continue attending. After all, I have a title to defend! Pat's inscription reads, "Many thanks for letting me represent my husband--he would be so grateful for the honor of the tributes to him--..Pat Priddy"